These hearty sweet potato burritos with black beans make a perfect vegetarian burrito. 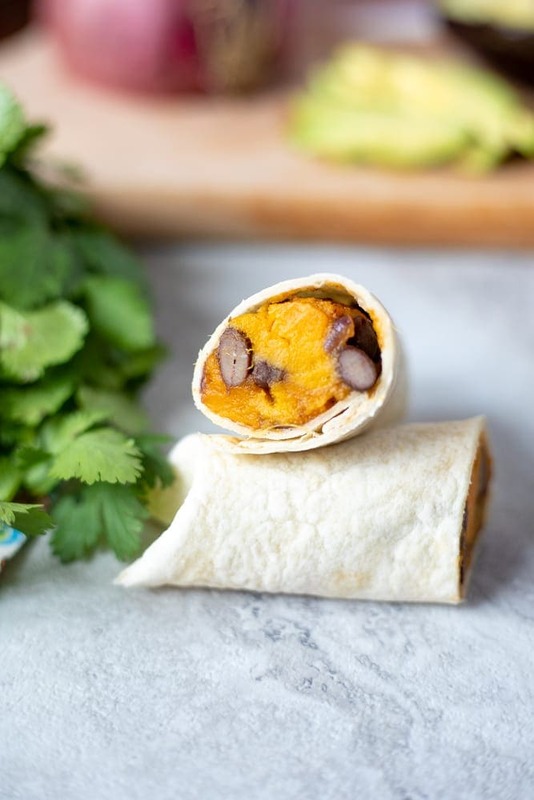 Filled with sweet potatoes, black beans and southwestern spices, these easy burritos are hearty, filling, and healthy! Looking for more Healthy Sweet Potato Recipes? Some of my favorites include Sweet Potato Black Bean Chili, Vegan Sweet Potato Casserole, and Sweet Potato Smoothie. My entire family loves to swap out PB and J sandwiches for burritos at lunch. Whether we have bean burritos or Sweet Potato Burritos, we really enjoy the change up from the typical brown bag experience. Not to mention both are tasty, filling, hearty, and healthy. I have already proven that black beans and sweet potatoes are a delicious combination with my Sweet Potato Nachos, but they also make a hearty filling for vegetarian burritos. 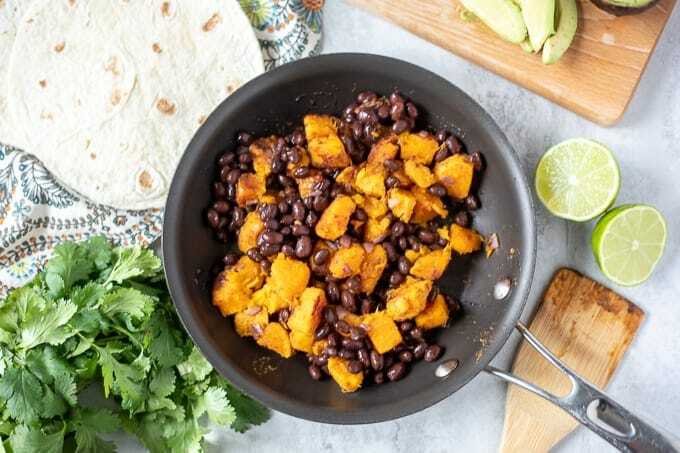 Seasoned sweet potatoes are pan fried until tender and slightly crispy and tossed with black beans and bright lime juice for a flavorful combination that is great all on it’s own, but made portable when stuffed into tortillas. In a large skillet, heat one tablespoon oil over medium heat. Add in peeled and cubed sweet potatoes, diced onion, and taco seasoning. Saute until potatoes are tender, turning frequently. This should take about 20 minutes. Add in black beans and cook for 2-3 minutes or until beans are warmed through. Zest one lime into skillet and then squeeze the juice of that lime into the sweet potato mixture. Stir to combine. In a dry skillet, heat flour or corn tortillas until warmed. Place 1/3 to 1/2 cup sweet potato black bean mixture onto warmed tortillas. Wrap up each burrito, folding up bottom, then sides, then rolling to seal. If you would like to make these Sweet Potato Burritos with less hands on effort, I suggest using Baked Sweet Potatoes. Place flesh of baked sweet potatoes into a mixing bowl. Add in taco seasoning, black beans, lime zest and lime juice. These vegetarian burritos are a great option for meal prep. They store for 5-6 days in the fridge and freeze well. To freeze sweet potato burritos, follow recipe as stated and wrap each burrito in foil or plastic wrap. Place in a freezer safe bag or container and freeze for 3-6 months. I like to grab one or two the night before place in fridge for school lunches. If you are not vegan, these black bean sweet potato burritos are great with 1 cup of shredded cheddar cheese mixed into the filling. In a medium skillet, heat one tablespoon oil over medium heat. Add in peeled and cubed sweet potatoes, diced onion, and taco seasoning. Saute until potatoes are tender, turning frequently. This should take about 20 minutes. Use corn or flour tortillas. I use 6 inch tortillas, but larger tortillas will work, the filling just will not stretch as far. If using canned black beans, be sure to rinse and drain before adding to skillet. The Sweet Potato Burrito recipe mentions adding the onions with cubed sweet potatoes. Onions are not in the ingredient list. I will just add to taste, but you may want to correct. Enjoy your blog very much; thank you.